First we decided to test this brand new game from the Goslar’s (Walter graciously decided to just watch to make this possible. Although he was a mean ice-block-roller in the end game!). 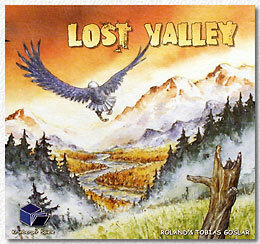 Players are prospectors who explore the lost valley (of Klondike?). The game combines a realistic approach with abstract and logical rules: Each player has a backpack for “raw materials” (food, timber, tools) and 6 more spaces for wares (whiskey, cart, boat, horse, rifle, axe, fishing rod, sieve, dynamite). The cart gives 4 more spaces for raw materials. Like in the computer game “Diablo” some objects take more space, for example timber and the sieve, so each player has to decide what objects are most important to her/him. All players start at the main trading post (others can appear through exploration). The exploration itself is handeld very nicely – players can decide where to put the diamond shaped land tiles and river tiles that they discover. As the diamond tiles don’t always leave room for a complete tile there are also special “triangle” tiles to fill these enclosed spaces. These diamond tiles are usually more interesting – in our first game we completely overlooked the methods to specially create the “triangles” which is something that should be explored more in future games. Tiles depict different landscapes – Gold can be found as “river gold” or “mountain gold” and is placed face down in values of 1-2 (river) or 3-4 (mountain). “River gold” needs water, but can also be found on land tiles – players have to build canals (by using timber) to get at the latter variety. They expend one “food” when looking for it, and a “sieve” doubles the amount of gold counters gained. “Mountain” gold is only found on mountain tiles and needs a working mine which first has to be built. Also getting mountain gold costs one timber in addition to the food (and using dynamite doubles the find). Getting gold nuggets is the object of the game – but you can also use gold to buy additional equipment at trading posts. Food is in issue – you need it for getting gold nuggets. You can hunt (by rolling a die against the animal – plus 3 if you buy a gun), as certain tiles have (hidden, various food values) animals on them. Fishing at the river is also possible – the fish trap and fishing rod come in handy here. Timber is necessary for mountain gold and canals – you can get it in wood spaces, easier if you use a sawmill (which has to be built first) and/or an axe. Players move along the tile edges – very slowly if by foot, and quicker if using the boat or the horse. It is not possible to block movement of other players, but non-river locations can only be occupied by ONE prospector, so you can protect certain spaces by simply standing there. This is sometimes necessary as EVERYTHING you build can be used by everybody – if you build a mine other players can use it as well! This very often results in races to gather the most gold from a specific location before others do (all gold locations can be depleted after the initially placed counters are gone). Therefore the game is mostly about the most efficient use of a limited number of actions (each turn every player has only ONE action). To get an edge in this you can also use “whiskey” (a very nice idea), which gives you an additional move OR an additional action. The game ends in two ways: 1) When the river has been fully explored the “source” is placed together with an ice block. Now every player rolls the die after his/her turn – on a 5 or 6 the ice block moves towards the original trading post, when it reaches it, the game ends. 2) When any player reaches the original trading post with 10 gold counters. In any case all formerly secret gold counters are revealed and counted, who now has the most “nuggets” printed on these counters wins. In our game we had a probably unusual end: 3 players ended up with 19 nuggets in the lead! As there seems to be no tiebreaker mechanic this probably means all three have won! The game has beautiful components (although good storage probably needs a couple of extra ziplock bags). 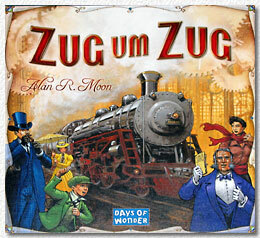 Game aids as well as rule book come in several languages (German, English, French). The rule book itself is a very good example of how to do it right: only 4 (small) pages with clear and precise rules, all well illustrated directly next to the rule to avoid any misunderstandings. Very well done! This is one of these rule books that you can practically sight read to your fellow players without having to read it yourself before – it will take 15 minutes maximum to get into the game. 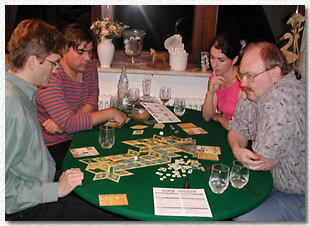 The game mixes elements of action management (Puerto Rico, Goa), discovery (Carcassonne, Die Entdecker) and even adventure/simulation games like “Valley of the Mammoths”. Turns go quick as player actions are limited – there is interaction (without obvious “kingmaking”) and some (but not too much) luck (hunting, nugget count). The theme should appeal to adults and kids as well, the only danger being a disappointment for the latter when they discover that behind the theme lies a pretty unforgiving mechanic that needs perfect resource management to win. The game’s “strategy tips” say that one should not hover far from the other players, which seems to be true, as basically the game makes the players into hyenas who lurk around until some poor soul builds the next mine or canal. One has to count the available gold counters and make sure that his action management results in getting more of the share than the others – only then should you build before the others do. As this is something that you have in your own hands the game is both challenging and rewarding, but also very often frustrating. But “wanting to do more than you actually can do” seems to be the sign of a good game, isn’t it? Next time I’ll try it!